facial muscle of cheek; origin, posterior portion of alveolar portion of maxilla and mandible and pterygomandibular raphe; insertion, angle of mouth; also become interspersed with more horizontal portions of the orbicularis oris; action, flattens cheek, retracts angle of mouth; plays an important role in mastication, working with tongue and orbicularis oris muscle to keep food between teeth; when it is paralyzed, as in Bell palsy, food accumulates in the oral vestibule; nerve supply, facial. the main muscle of the cheek, one of the 12 muscles of the mouth. It is pierced by the duct of the parotid gland opposite the second molar tooth. The buccinator, innervated by buccal branches of the facial nerve, compresses the cheek, acting as an important accessory muscle of mastication by holding food under the teeth. Latin: trumpeter; A muscle of the cheek. Retracts angle of mandibula, compresses cheek. Buccinator ridge of mandible, alveolar process of maxilla, pterygomandibular ligament. Orbicularis oris at angle of jaw. Origin, posterior portion of alveolar portion of maxilla and mandible and pterygomandibular raphe; insertion, orbicularis oris at angle of mouth; action, flattens cheek, retracts angle of mouth; nerve supply, facial. Plays an important role in mastication, working with tongue to keep food between teeth; when it is paralyzed, food accumulates in the oral vestibule. Synonym(s): musculus buccinator [TA] . Cheek Strengthening the 5 series of 15 buccinator muscle seconds 3 to 7 series of 10 movements in Tongue Adapt tongue the rhythm of one ISOTONIC mobility second, with interval of 10 seconds between Cheek Working the the series. The parotid duct passes along the lateral surface of the buccal fat pad or penetrates the body of the fat pad before it opens on the buccinator muscle. 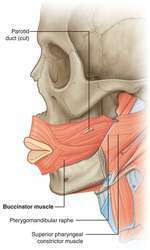 To identify the action of the buccinator muscles, bring your head into balance. After full maxillary bone repair ** After full mandibular bone repair Cheeks: apply resistance with a tongue depressor against the buccal region on 3 bundles of the buccinator muscle. Anderson et al  studied the components of RMF & RMC and found that these contained nerve fibres, which supplied the 3rd molar pulp, retromolar area, temporalis and buccinator. Posteromedially, at the level of the hard palate (the superior aspect of the buccal space), the superficial layer of the deep cervical fascia (SLDCF) extending between the masseter and the buccinator muscle is incomplete, allowing spread of pathology between the buccal space and the masticator space. The angle between the medial surface of the mandible and the buccinator muscle limits the buccotemporal space. Then there is a muscle inside each cheek called the buccinator, which goes more or less from the mouth out towards the ear, and when that contracts it controls the position of the lips. The ecology of the trumpeter swan (Olor buccinator Richardson) on Red Rock Lakes National Wildlife Refuge, Montana. The use of the bottle favors the work of a reduced group of orofacial muscles, favoring the activity of the buccinator muscles and the orbicularis of the mouth, compromising the correct development of the craniofacial complex and, thus, being associated with alterations in the articulation of speech sounds .